You can read the whole thing here. I highly recommend this show! It is a great piece in a top-notch and hilarious Alden production, and that’s a winning combination (check out the video below). It’s actually been quite a fortnight for opera in New York, between Giulio Cesare, Mosè in Egitto, best of all David et Jonathas at BAM, and finally after all those Egyptians and Romans, then Israelites and Egyptians, and then Israelites and Philistines, finally ending with this insanely delightful farce that just has Peruvians. It’s also basically the end for me of this season’s operatic adventures in NYC, though the Phil’s Dallapiccola in June will provide a coda. I recommend y’all go see Dialogues of the Carmelites at the Met, but there are only three performances and unfortunately none of them fit into my schedule. 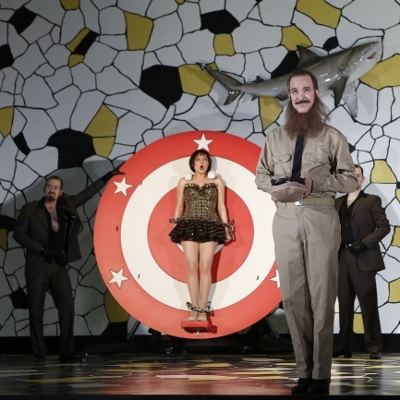 As you may remember, I have mixed feelings about this piece and have seen it twice recently, once in Robert Carsen’s excellent traditional staging and once in Calixto Bieito’s excellent non-traditional staging, so I don’t regret it too much. It will spare you my habit of nun puns (sorry). Anyway, I have some other stuff elsewhere coming up, so I’ll see you soon-ish in any case. Fans of nun puns can just wait for my review of Carsen's cloisterphobic production of Dialogues in Toronto. I promise it will be habit forming.